I had such a brilliant lunch last Friday at Kauppahalli. 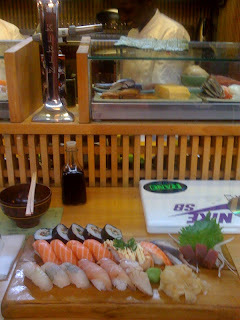 Out of many different small food stands, the plan was simple, eat propa sushi! Uuuhh Lord, did we eat loads!...Yes we did! Our Sushi cookin´ favorite Josephine, made us killer plates. The outcome was heavenly, thank you. Sushi aestetics can be found from Japanise dancin´also.